Sleep characterization in children may have a role in evaluation for risk of impaired development, behavior, mood, and self-regulation. Sleep is homeostatically regulated and development correlates well with the progression of active neuromaturation. Sleep evolves with recognized changes in number of hours needed, progressive consolidation of sleep, and changes in circadian and ultradian rhythm as a function of age and development (Figure 1).1-3 Recognition of this intimate relationship has increased research to understand how neurodevelopment markers are related to pediatric sleep patterns and possible use of sleep-wake characteristics as a modifiable biomarker for neurodevelopment. Figure 1. Developmental Ontogeny of Sleep. Developmental sleep needs by hour and distribution across 24 hours, based on age. There appears to be a developmental component to the circadian rhythm, because it also changes with age. Neonates lack circadian rhythm until age 6 to 12 weeks, after which circadian rhythm strengthens with age as greater nocturnal sleep consolidation and eventual loss of daytime napping develop.4,8,9 Maturation of the SCN, in combination with exposure to ex-ternal zeitgebers contributes to this development.10-12 There is evidence that premature infants have an earlier emergence of the circadian rhythm than full-term infants, with longer consolidated nocturnal sleep periods and less nighttime activity.9 In adolescence, there is a biologic delay in circadian phase that occurs in conjunction with reduced accumulation of homeostatic sleep pressure, resulting in later sleep onset.13,14 With advancing age, circadian rhythms become less stable and more phase advanced, resulting in earlier sleep onset and possibly contributing to greater sleep fragmentation.15 Multiple circadian clock genes that generate and sustain circadian cycles via transcriptional-translational negative feedback loops also contribute to individual variability in sleep architecture.16-19 These genes have been replicated outside the central nervous system (CNS), within cells and organs isolated from SCN input and even grown in vitro, suggesting an ability to self-regulate activity on a circadian basis.20,21 Thus, genetic variability in circadian-clock genes may influence not only circadian sleep-wake cycles but also the biorhythms of somatic functions, from metabolism to gastrointestinal motility. Figure 2. Ultradian rhythm cycle development shows evolution of sleep architecture and cycle length by age. Children with sleep disorders have structural differences in brain development.51,52 Although frequently thought to be exclusive to hypoxemia caused by sleep apnea, these morphologic findings are replicated in other causes patients with other sleep-wake problems, reinforcing the suggestion that structural differences may be related to sleep dysfunction itself (Table 2).51,53-58 Sleep dysfunction from any cause is a serious consideration in development, as it may lead to irreversible morphologic changes and inappropriate neural organization. It may be possible to characterize neurogenetic syndromes by specific sleep phenotypes. Sleep problems in early infancy have been identified for some disorders, such as Angelman and Williams syndrome, and others later in childhood, such as Prader-Willi syndrome (PWS).31 There may be differences not only in timing of onset but also in the chronicity and clinical features of sleep. For instance, Angelman syndrome sleep features are generally characterized by reduced total sleep time, increased sleep onset latency, disrupted sleep architecture with frequent nocturnal awakenings, increased periodic leg movements, and reduced REM sleep during early childhood that commonly improve with age.66 In contrast, individuals with PWS frequently develop sleep symptoms later, which include hypersomnia disorders—including narcolepsy—and sleep-disordered breathing. In these individuals, susceptibility to hypersomnia is thought to be related to hypothalamic dysfunction; whereas, the risk for obstructive sleep apnea is likely a consequence of hyperphagia and obesity.67 In these patients, sleep dysfunction is unlikely to improve, commonly persists, and can even worsen. This highlights how sleep characteristics could potentially serve as a biomarker, leading to earlier identification of the syndromes. In addition to clinical sleep features, neurophysiologic features identified on polysomnography can provide unique sleep profiles by syndrome. For example, when compared to neurotypical children, children with Williams syndrome display an atypical, but characteristic sleep pattern of decreased sleep time with reduced sleep efficiency related to increased waking after sleep onset, increased NREM percentage and increased SWS, irregular ultradian patterns, and increased number of leg movements.68 Syndrome-specific screening and treatment protocols are needed to better identify and manage sleep problems in patients with neurogenetic disorders. Sleep is a homeostatically regulated process of elaborate, intrinsic neurocircuitry that evolves with neuromaturation. This overlap in development is reflected in the changes seen in the number of hours of sleep needed, the progressive consolidation of sleep, and the entrainment of circadian and ultradian rhythms, as a function of age and developmental status. Sleep plays a significant role in learning, memory, self-regulation, and mood that varies with both patient and sleep state. Studies evaluating the effects of sleep deprivation on learning underscore the deleterious impact of insufficient quantity and quality of sleep on neurotypical development. 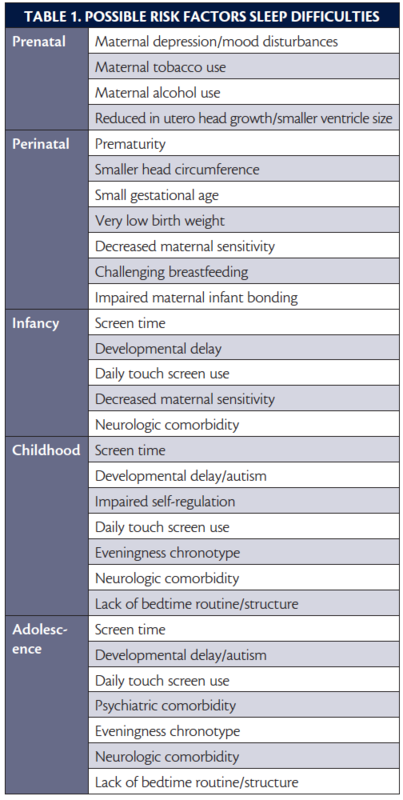 A detailed characterization of sleep in infants, children, and adolescents is an important part of evaluating for risk factors for impaired development, behavior, mood, and self-regulation. In neonates, the presence of poorly organized (indeterminate) sleep is among the most predictive variables of cognitive outcome at age 12 years.48 Children who are more vulnerable to impaired neurodevelopment, such as neurogenetic syndromes or with developmental brain disorders, are at even higher risk for sleep disorders and should receive regular sleep screening. Early identification of and intervention for individuals with inappropriate sleep-wake cycles may aid in augmenting neurodevelopmental outcomes, with benefit to cognition, behavior, mood, and self-regulation. 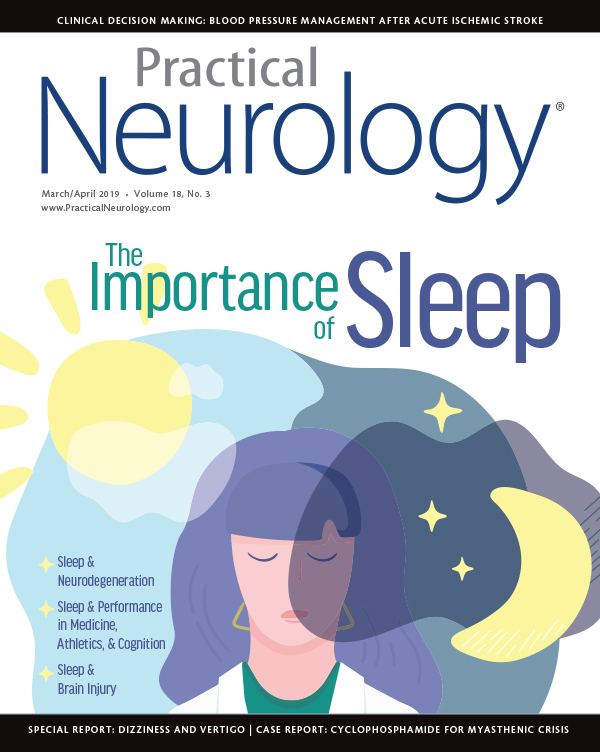 Further studies are needed to explore the use of sleep-wake evaluations—both objective and subjective measures—as tools to assist in earlier identification and prognostication of impaired neurodevelopment. In addition, studies evaluating sleep as an additional standardized early intervention therapy to enhance developmental outcomes should be explored in patient populations already identified as at-risk (eg, ASD). Improved characterization of genetic factors that influence risk for development of sleep disorders can provide insights into the basis of sleep-wake disorders in the general population and highlight strategies for personalized treatment in patients with genetic syndromes. In addition to considering neurodevelopmental evolution of phenotypic expression of multiomics (genetic, epigenetic, and proteomic), studies directed at identifying the primary genes that contribute to sleep disorders and those that may indicate differential vulnerability to the detrimental effects of sleep disruption are needed. 1. Hirshkowitz M, Whiton K, Albert SM, et al. National Sleep Foundation’s sleep time duration recommendations: methodology and results summary. Sleep Health. 2015;1(1):40-43. 2. Sheldon HS, Spire JP, Levy HB. Pediatric Sleep Medicine. WB Saunders Co; 1992. 3. Roffwarg HP, Muzio JN, Dement WC. Ontogenetic development of the human sleep-dream cycle. Science. 1966; 152(3722):604-619. 4. Bathory E, Tomopoulos S. Sleep regulation, physiology and development, sleep duration and patterns, and sleep hygiene in infants, toddlers, and preschool-age children. Curr Probl Pediatr Adolesc Health Care. 2017;47(2):29-42. 5. Borbély AA, Achermann P. Sleep homeostasis and models of sleep regulation. J Biol Rhythms. 1999;14(6):557-568. 6. Daan S, Beersma DG, Borbely AA. Timing of human sleep: recovery process gated by a circadian pacemaker. Am J Physiol. 1984;246(2 Pt 2):R161-R183. 7. Herman JH. 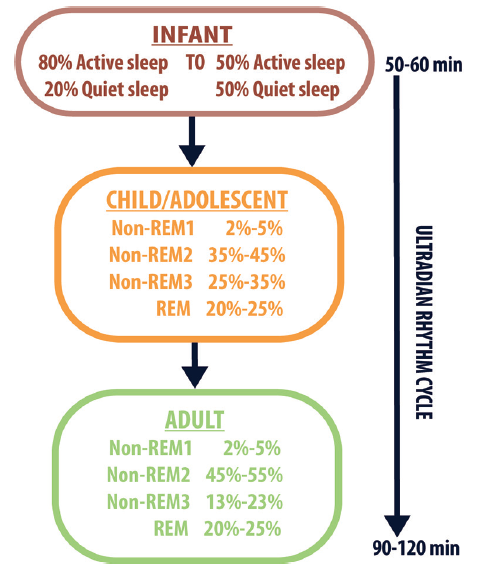 Chronobiology of sleep in children. In: Sheldon S, ed. Principles and Practice of Pediatric Sleep Medicine. 1st ed. Elsevier; 2005: 85-99. 8. Rivkees SA. Developing circadian rhythmicity in infants. Pediatrics. 2003;112(2):373-381. 9. Guyer C, Huber R, Fontijn J, et al. Very preterm infants show earlier emergence of 24-hour sleep–wake rhythms compared to term infants. Early Hum Dev. 2015;91(1):37-42. 10. Achermann P, Borbély AA. Mathematical models of sleep regulation. Front Biosci. 2003;8:s683-s693. 11. Hao H, Rivkees SA. The biological clock of very premature primate infants is responsive to light. Proc Natl Acad Sci. USA 1999;96(5):2426-2429. 12. Löhr B, Siegmund R. Ultradian and circadian rhythms of sleep-wake and food-intake behavior during early infancy. Chronobiol Int. 1999;16(2):129-148. 13. Crowley SJ, Acebo C, Carskadon MA. Sleep, circadian rhythms, and delayed phase in adolescence. Sleep Med. 2007;8(6):602-612. 14. Wilhelmsen-Langeland A, Saxvig IW, Johnsen EH, et al. Patients with delayed sleep-wake phase disorder show poorer executive functions compared to good sleepers. Sleep Med. 2019;54:244-249. 15. Monk TH. Aging human circadian rhythms: conventional wisdom may not always be right. J Biol Rhythms. 2005;20(4):366-374. 16. Franken P, Dijk D. Circadian clock genes and sleep homeostasis. Eur J Neurosci. 2009;29(9):1820-1829. 17. Lowrey PL, Takahashi JS. Genetics of the mammalian circadian system: Photic entrainment, circadian pacemaker mechanisms, and posttranslational regulation. Annu Rev Genet. 2000;34(1):533-562. 18. Reppert SM, Weaver DR. Coordination of circadian timing in mammals. Nature. 2002;418(6901):935. 19. Takahashi JS. Finding new clock components: past and future. J Biol Rhythms. 2004;19(5):339-347. 20. Husse J, Eichele G, Oster H. Synchronization of the mammalian circadian timing system: light can control peripheral clocks independently of the SCN clock: alternate routes of entrainment optimize the alignment of the body’s circadian clock network with external time. Bioessays. 2015;37(10):1119-1128. 21. Yamazaki S, Numano R, Abe M, et al. Resetting central and peripheral circadian oscillators in transgenic rats. Science. 2000288(5466):682-685. 22. Basheer R, Strecker RE, Thakkar MM, McCarley RW. Adenosine and sleep–wake regulation. Prog Neurobiol. 2004;73(6):379-396. 23. Porkka-Heiskanen T. Sleep homeostasis. Curr Opin Neurobiol. 2013 Oct;23(5):799-805. 24. Reichert CF, Maire M, Schmidt C, Cajochen C. Sleep-wake regulation and its impact on working memory performance: the role of adenosine. Biology. 2016;5(1):11. 25. Tononi G, Cirelli C. Sleep and the price of plasticity: from synaptic and cellular homeostasis to memory consolidation and integration. Neuron. 2014;81(1):12-34. 26. Galland BC, Taylor BJ, Elder DE, Herbison P. Normal sleep patterns in infants and children: a systematic review of observational studies. Sleep Med Rev. 2012;16(3):213-222. 27. Mindell JA, Owens JA, Carskadon MA. Developmental features of sleep. Child Adolesc Psychiatr Clin N Am. 1999;8(4):695-725. 28. Lopp S, Navidi W, Achermann P, LeBourgeois M, Diniz Behn C. Developmental changes in ultradian Sleep cycles across early childhood: preliminary insights. J Biol Rhythms. 2017;32(1):64-74. 29. Fricke-Oerkermann L, Plück J, Schredl M, et al. Prevalence and course of sleep problems in childhood. Sleep. 2007;30(10):1371-1377. 30. Cortesi F, Giannotti F, Ivanenko A, Johnson K. Sleep in children with autistic spectrum disorder. Sleep Med. 2010;11(7):659-664. 31. Abel EA, Tonnsen BL. Sleep phenotypes in infants and toddlers with neurogenetic syndromes. Sleep Med. 2017;38:130-134. 32. Robinson-Shelton A, Malow BA. 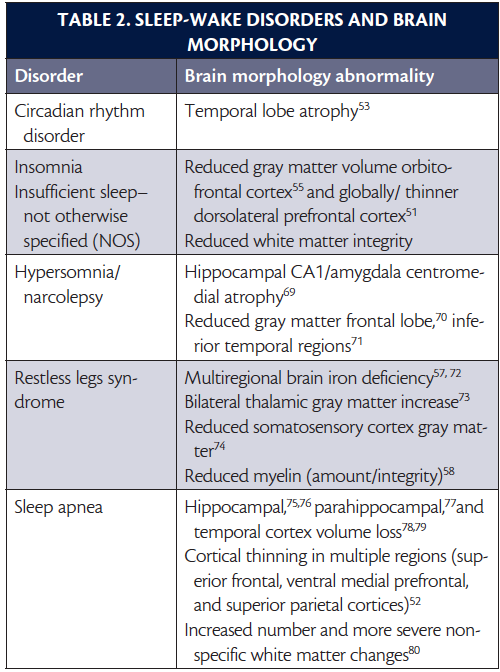 Sleep disturbances in neurodevelopmental disorders. Curr Psychiatry Rep. 2016;18(1):6. 33. Hupbach A, Gomez RL, Bootzin RR, Nadel L. Nap‐dependent learning in infants. Dev Sci. 2009;12(6):1007-1012. 34. Kurdziel L, Duclos K, Spencer RM. Sleep spindles in midday naps enhance learning in preschool children. Proc Natl Acad Sci USA. 2013;110(43):17267-17272. 35. Gómez RL, Edgin JO. Sleep as a window into early neural development: shifts in sleep‐dependent learning effects across early childhood. Child Dev Perspect. 2015;9(3):183-189. 36. de Bruin EJ, van Run C, Staaks J, Meijer AM. Effects of sleep manipulation on cognitive functioning of adolescents: a systematic review. Sleep Med Rev. 2017;32:45-57. 37. Mary AC, Harvey K, William CD. Sleep loss in young adolescents. Sleep. 1981;4(3):299-312. 38. Louca M, Short MA. The effect of one night’s sleep deprivation on adolescent neurobehavioral performance. Sleep. 2014;37(11):1799-1807. 39. Williams KE, Berthelsen D, Walker S, Nicholson JM. A developmental cascade model of behavioral sleep problems and emotional and attentional self-regulation across early childhood. Behav Sleep Med. 2017;15(1):1-21. 40. Kamdar BB, Kaplan KA, Kezirian EJ, Dement WC. The impact of extended sleep on daytime alertness, vigilance, and mood. Sleep Med. 2004;5(5):441-448. 41. Tempesta D, Socci V, De Gennaro L, Ferrara M. Sleep and emotional processing. Sleep Med Rev. 2018;40:183-195. 42. Kirszenblat L, van Swinderen B. The yin and yang of sleep and attention. Trends Neurosci. 2015;38(12):776-786. 43. Scott N, Blair PS, Emond AM, et al. Sleep patterns in children with ADHD: a population-based cohort study from birth to 11 years. J Sleep Res. 2013;22(2):121-128. 44. Gillioen B, Plancoulaine S, Montemitro E, et al. Maturation of arousals during day and night in infants with non-smoking and smoking mothers. Early Hum Dev. 2017;115:46-50. 45. Bat-Pitault F, Sesso G, Deruelle C, et al. Altered sleep architecture during the first months of life in infants born to depressed mothers. Sleep Med. 2017;30:195-203. 46. Stangenes KM, Fevang SK, Grundt J, et al. Children born extremely preterm had different sleeping habits at 11 years of age and more childhood sleep problems than term‐born children. Acta Paediatrica. 2017;106(12):1966-1972. 47. Caravale B, Sette S, Cannoni E, et al. Sleep characteristics and temperament in preterm children at two years of age. J Clin Sleep Med. 2017;13(9):1081-1088. 48. Field T. Infant sleep problems and interventions: a review. Infant Behav Dev. 2017;47:40-53. 49. Van der Heijden K, Stoffelsen R, Popma A, Swaab H. Sleep, chronotype, and sleep hygiene in children with attention-deficit/hyperactivity disorder, autism spectrum disorder, and controls. Eur Child Adolesc Psychiatry. 2018;27(1):99-111. 50. Kocevska D, Verhoeff ME, Meinderts S, et al. Prenatal and early postnatal measures of brain development and childhood sleep patterns. Pediatr Res. 2018;83(4):760-766. 51. Kocevska D, Muetzel RL, Luik AI, et al. The developmental course of sleep disturbances across childhood relates to brain morphology at age 7: the generation R study. Sleep. 2017;40(1). 52. Macey PM, Kheirandish-Gozal L, Prasad JP, et al. Altered regional brain cortical thickness in pediatric obstructive sleep apnea. Front Neurol. 2018;9:4. 53. Van Someren EJ, Oosterman J, Van Harten B, et al. Sleep-wake rhythm fragmentation relates more strongly than age and any other known risk to medial temporal lobe atrophy. Neurobiol Learn Mem. 2018;S1074-7427(18)30128-X. 54. Weng H, Chen C, Tsai Y, et al. Gray matter atrophy in narcolepsy: an activation likelihood estimation meta-analysis. Neurosci Biobehav Rev. 2015;59:53-63. 55. Altena E, Vrenken H, Van Der Werf, et al. Reduced orbitofrontal and parietal gray matter in chronic insomnia: a voxel-based morphometric study. Biol Psychiatry. 2010;67(2):182-185. 56. Telzer EH, Goldenberg D, Fuligni AJ, Lieberman MD, Gálvan A. Sleep variability in adolescence is associated with altered brain development. Dev Cogn Neurosci. 2015;14:16-22. 57. Connor JR, Boyer PJ, Menzies SL, et al. Neuropathological examination suggests impaired brain iron acquisition in restless legs syndrome. Neurology. 2003;61(3):304-309. 58. Connor JR, Ponnuru P, Lee B, et al. Postmortem and imaging based analyses reveal CNS decreased myelination in restless legs syndrome. Sleep Med. 2011;12(6):614-619. 59. Glickman G. Circadian rhythms and sleep in children with autism. Neurosci Biobehav Rev. 2010;34(5):755-768. 60. Kotagal S, Broomall E. Sleep in children with autism spectrum disorder. Pediatr Neurol. 2012;47(4):242-251. 61. Karaivazoglou K, Assimakopoulos K. Circadian dysregulation in young children with autism spectrum disorder. J Sleep Med Disord. 2018;5(2):1092. 62. Tordjman S, Davlantis KS, Georgieff N, et al. Autism as a disorder of biological and behavioral rhythms: toward new therapeutic perspectives. Front Pediatr. 2015;3:1. 63. Tordjman S, Najjar I, Bellissant E, et al. Advances in the research of melatonin in autism spectrum disorders: literature review and new perspectives. Int J Mol Sci. 2013;14(10):20508-20542. 64. Brown R, Hobson RP, Lee A, Stevenson J. Are there “autistic‐like” features in congenitally blind children? J Child Psychol Psychiatry. 1997;38(6):693-703. 65. Donaldson AI, Heavner KS, Zwolan TA. Measuring progress in children with autism spectrum disorder who have cochlear implants. Arch Otolaryngol Head Neck Surg. 2004;130(5):666-671. 66. Pelc K, Cheron G, Boyd SG, Dan B. Are there distinctive sleep problems in Angelman syndrome? Sleep Med. 2008;9(4):434-441. 67. Swaab D. Prader-Willi syndrome and the hypothalamus. Acta Paediatrica. 1997;86(S423):50-54. 68. Gombos F, Bódizs R, Kovács I. Atypical sleep architecture and altered EEG spectra in Williams syndrome. J Intellect Disabil Res. 2011;55(3):255-262. 69. Kim H, Suh S, Joo EY, Hong SB. Morphological alterations in amygdalo-hippocampal substructures in narcolepsy patients with cataplexy. Brain Imaging Behav. 2016;10(4):984-994. 70. Brenneis C, Brandauer E, Frauscher B, et al. Voxel-based morphometry in narcolepsy. Sleep Med. 2016;6(6):531-536. 71. Kaufmann C, Schuld A, Pollmächer T, Auer DP. Reduced cortical gray matter in narcolepsy: preliminary findings with voxel-based morphometry. Neurology. 2002;58(12):1852-1855. 72. Connor J.R., Ponnuru, P., Lee, B.Y., et al. Postmortem and imaging based analyses reveal CNS decreased myelination in restless legs syndrome. Sleep Med. 2011;12(6):614-619. 73. Etgen T, Draganski B, Ilg C, et al. Bilateral thalamic gray matter changes in patients with restless legs syndrome. Neuroimage. 2005;24(4):1242-1247. 74. Unrath A, Juengling FD, Schork M, Kassubek J. Cortical grey matter alterations in idiopathic restless legs syndrome: an optimized voxel-based morphometry study. Movement Dis. 2007;22(12):1751-1756. 75. Morrell MJ, McRobbie DW, Quest RA,et al. Changes in brain morphology associated with obstructive sleep apnea. Sleep. Med. 2003;4(5):451-454. 76. Canessa N, Castronovo V, Cappa SF, et al. Obstructive sleep apnea: brain structural changes and neurocognitive function before and after treatment. Am J Resp Crit Care.2011;183(10):1419-1426. 77. Macey PM, Henderson LA, Macey KE, et al. Brain morphology associated with obstructive sleep apnea. Am J Resp Crit Care. 2002;166(10):1382-1387. 78. Morrell MJ, Jackson ML, Twigg GL, et al. Changes in brain morphology in patients with obstructive sleep apnoea. Thorax. 2010; 65(10):908-914. 79. Yaouhi K, Bertran F, Clochon P, et al. A combined neuropsychological and brain imaging study of obstructive sleep apnea. J Sleep Res. 2009;8(1):36-48. 80. Ho BL, Tseng PT, Lai CL, et al. Obstructive sleep apnea and cerebral white matter change: a systematic review and meta-analysis. J Neurol. 2018;265(7):1643-1653. AMM has no financial or other relationships relevant to this content to disclose.